Open Innovation entails looking outside your own organizational boundaries to source new, innovative ideas for future products and services. This active listening approach keeps organizations from becoming insular and out of touch with customer needs. 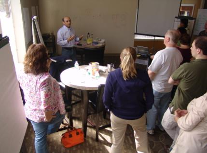 The DeSai Group Customer Ethnography Retreat provides a forum to grow customer understanding, develop product innovation vision & design, and increase sales effectiveness. This is accomplished by embedding the customer in an offsite idea generation process. When combined in an advisory board context, it grows customer perception of your company as a collaborative innovation leader and subsequent customer loyalty. The "customer" can be channel partners (e.g., resellers, distributors), internal stakeholders (e.g., salespeople, product support), end customers (e.g., corporate customers, consumers), or industry leaders (e.g., influential luminaries, bloggers). Breakthrough Ideas from Beyond the Box: Our proprietary processes take your team to a place where there is no "box-to-get-out-of"; our facilitators use a unique set of tools and techniques blended with today's best practices, that move participants beyond brainstorming-as-usual, to generate paradigm-breaking ideas. Relevance to Your Target and to Your Brand: Our sessions include sustainability experts, "conscious creatives", your customer and your internal team to ensure a wholeness of perspective, and the generation of concepts that are both innovative and relevant. Stress-Free Process: Instead of just focusing on "fast", our processes work to expand time, giving your team plenty of safe space to leave their comfort zone to stretch their thinking, incubate and connect great ideas, to choose the high interest possibilities clearly, and to finish renewed, energized and enthused. Trusted Results: We've done it for hundreds of Fortune 500 teams and individuals, and we can do it for you! We're intuitive, open-minded and masterful based on decades of experience you'll recognize immediately as the embodiment of confidence & brilliance you can trust to get results. Marketing: when you need to fill your new product innovation pipeline for years to come. Sustainability: creating a new service or enhancing an existing one, positioning a new product to connect with your environmentally-conscious customers or defining a new green product or brand. Training & HR: develop emerging or experienced leaders to think more strategically. Corporate Strategy: When you have an internal business opportunity or team challenge that needs an innovative approach to communications, leadership or innovation. To learn more about how we can assist, please contact us at info@desai.com or call 860-233-0011 to set up an introductory phone meeting. We invite you to visit our resources page where you can download articles, podcasts and stories. 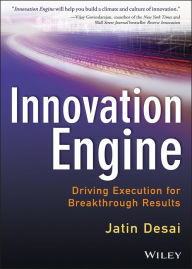 You can also visit our video gallery and Jatin DeSai's Blog to learn more about his view on business innovation, strategic planning, organizational leadership, and global trends.